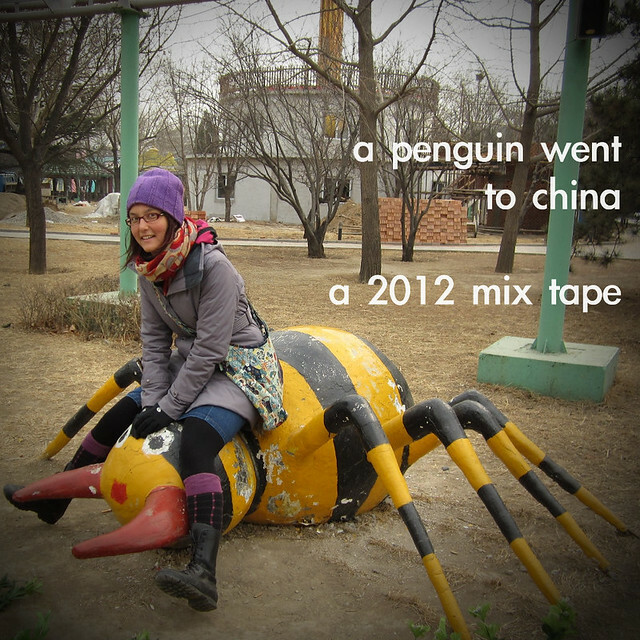 a penguin went to china and all i got was this lousy mixtape. You can also read about my year in my summary post. Download it as a zip at mediafire (I've never used mediafire before so lemme know if it doesn't work or you need it somewhere else), or click through the links for the videos. Also let me know if you'd just like one or two songs in particular, and we'll see what can be done. If you download it, let me know, and please let me know your thoughts about my favourite songs this year. So I can take it personally. Also I JUST REALISED I typed this as 'song of the travelling penguin' into the cover art but that's too gold to change. Because this song was super famous and attached to a major tv series. Another sunrise, another sunset / Soon it'll all be yesterday / Another good day, another bad day / What did you do today? 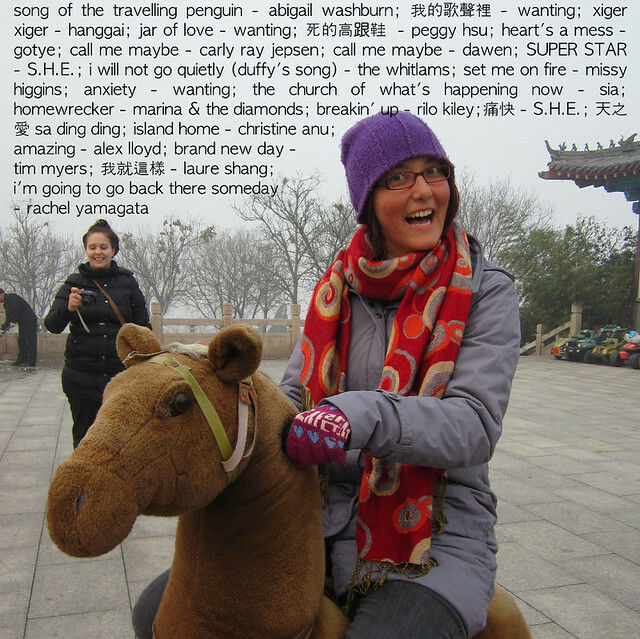 Sometimes I struggled when I was in China, and lost perspective and threw up my arms and cried. And sometimes I didn't. Which is actually a little sad but I love it anyway. Okay this is a fun song and all, but because I missed the big Gotye time of late 2011 (due to China!) I kind of got into him really heavily upon my return to Australia, much to the chagrin of my alt-indie muso friends. Even in China, I am not immune to a song that goes viral. Also it describes my feelings about China. So it's perfect. My ringtone. Try not to think about the words, but every time my phone rings it's like that scene in Scrubs where JD is calling Turk to bail him out of jail but everyone in the hospital reception is dancing to Turk's ringtone so he can't answer. This is always my song. Not necessarily because I live it, but because I want to. So, uh. Depression. Anxiety. Etc. Because I love singing this song, even though it's a ridiculously sappy lovesong. Because sometimes you need the support. And also because you're amazing, and we did amazing things. Because I'm awesome and I should remember that. and bonus music video: ‪新贵妃醉酒-Li Yu Gang(李玉刚)‬ for a song I love at KTV. I tried to download your awesome music, but I get an error at MediaFire. It says "Permission Denied" and then ""Not provided by submitter" by Not provided by submitter can be downloaded from one of these fine retailers." BOOOO. Try this sendspace link and let me know? And I will investigate the mediafire link. thanks for this - i got the same error at mediafire. i'm going to listen today, i hope! hooray! let me know how it goes and i hope you like it! I quite enjoyed these, thank you! I am glad, and you are welcome!